Eternal God, who didst call Gregorio Aglipay to witness to thy truth in the renewal of thy Church in the Philippines: Help us, like him, to be guided by thy Holy Spirit, that people everywhere may hear the saving words of our Savior, so that all may believe and find eternal life; through the same Jesus Christ who, with thee and the Holy Spirit, livest and reignest, one God, for ever and ever. Amen. Eternal God, you called Gregorio Aglipay to witness to your truth in the renewal of your Church in the Philippines: Help us, like him, to be guided by your Holy Spirit, that people everywhere may hear the saving words of our Savior, so that all may believe and find eternal life; through the same Jesus Christ who, with you and the Holy Spirit, lives and reigns, one God, for ever and ever. Amen. 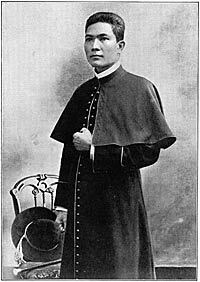 Gregorio Labayan Aglipay (May 8, 1860 – September 1, 1940) was the first Filipino Supreme Bishop of the Philippine Independent Church. He was an activist Catholic priest from Ilocos Norte who, despite his intercession and defense of some of the Spanish Catholic clergy from liberal-nationalist Filipino revolutionaries, was excommunicated by the Vatican for inciting rebellion within the Filipino clergy. During the brief interlude between independence from the Spanish and the subsequent reoccupation by the Americans, Isabelo de los Reyes (also known as Don Belong) and Aglipay reformed the Filipino Catholic clergy into the Philippine Independent Church, officially established in 1902.